As the Obama administration intensifies efforts to stop the influx of Central American families entering the United States without legal documents, detaining growing numbers of children, it's generating a potentially lucrative opportunity for one industry: private prison operators. Karnes County, Texas, awarded a contract earlier this month to GEO Group, Inc. (NYSE:GEO) -- the second-largest private prison company in the country, after the Corrections Corporation of America (NYSE:CXW) -- to operate a detention facility for migrant families. The Karnes County Civil Detention Center currently holds adult male migrant detainees, but is being cleared to make way for around 600 migrant women and children. GEO Group and Karnes County officials didn't respond to requests for comment on the value of the contract, but their 2010 agreement (pdf) for the male detainees amounted to about $14 million per year. The Karnes County detention center would represent the first major intersection between one of the private prison behemoths and the recent wave of Central American child migrants. Only two family detention centers, one in Pennsylvania and one in New Mexico, are currently in operation, and are government-run. But the Obama administration is looking to make way for more family detention centers in the coming months, which may allow private prison companies -- which already operate more than half of the immigrant detention beds in the country -- to increase their footprint and their profits. Much of the national U.S. debate so far has focused on unaccompanied child migrants, who go through a particular system: they stay in Border Patrol processing facilities before being transferred to shelters sponsored by the Department of Health and Human Services, where they are matched with family members in the U.S. and stay with them until their immigration court date. The process is different for family units. From 2006 to 2009, many immigrant families were detained at the privately run T. Don Hutto Residential Center in Texas. But human rights and immigrant advocacy groups issued a barrage of lawsuits and complaints over conditions at the center, which they likened to a prison. The government shut the Hutto center down in 2009. Since then, the only migrant family detention center in operation had been the Berks Family Residential Center in Pennsylvania, with a capacity of only 90 beds. Border Patrol agents, until recently, have released migrant families at bus stations with immigration court notices after apprehending them at the border. The Associated Press reported that the Obama administration, on seven separate occasions over the past two months, declined to provide numbers for how many families it had released this way. But the number of migrant families crossing into the U.S. skyrocketed over the past year. According to Border Patrol statistics, the agency has apprehended more than 55,000 family units since October -- nearing the figure for the 57,000 unaccompanied children who have crossed the border in that same period of time. More family detention centers are in the works: According to Secretary Johnson, President Obama’s request for $3.7 billion to handle the unaccompanied child migrants includes $879 million for 6,350 more beds for detained families. House Republicans’ slimmer appropriations bill, released Tuesday, includes funds for “increased and upgraded detention space” in the $334 million set-aside for the Immigration and Customs Enforcement agency. This leaves plenty of room for the private prison companies to run the family detention centers that may open in the coming months, depending on what appropriations measures are passed. Immigration detention, which costs an average of around $120 per day per bed, has proven lucrative for private prison companies. NBC News reported that GEO Group secured $240 million last year in contracts with the Immigrations and Customs Enforcement agency. But the private prison industry has come under harsh scrutiny on a number of fronts. CCA, the country’s largest private prison company, operated the much-maligned T. Don Hutto family detention center shuttered by the government in 2009, at the cost of $200 per day per bed. Several investigative reports have also spotlighted links between these companies and lobbying campaigns for enforcement-heavy immigration policies. Bob Libal, executive director of Grassroots Leadership, an advocacy organization that has campaigned against family detention and the for-profit prison industry, said the government would likely be eager to keep contracting family detention centers to private companies. “It’s an easy solution for the government because there are private prison corporations that have excess capacity, particularly today, with declining state prison populations,” he said. “And it’s about influence -- private prison corporations are enormously powerful, particularly in immigration.” Libal noted that Julie Myers Wood, former head of U.S. Immigration and Customs Enforcement, is a member of GEO Group’s board of directors, and that David Venturella, former head of the "Secure Communities" enforcement program, is now a GEO Group senior vice president. Even without the involvement of for-profit prison organizations, family detention conditions have already riled up immigrant rights’ groups. Delegates from 22 immigrant law and advocacy groups visited the Artesia detention center last week, with grim reports of “horrific” conditions and extremely limited access to legal assistance. Congress is set to vote Thursday on funding measures for the border issue before its five-week recess begins Friday. 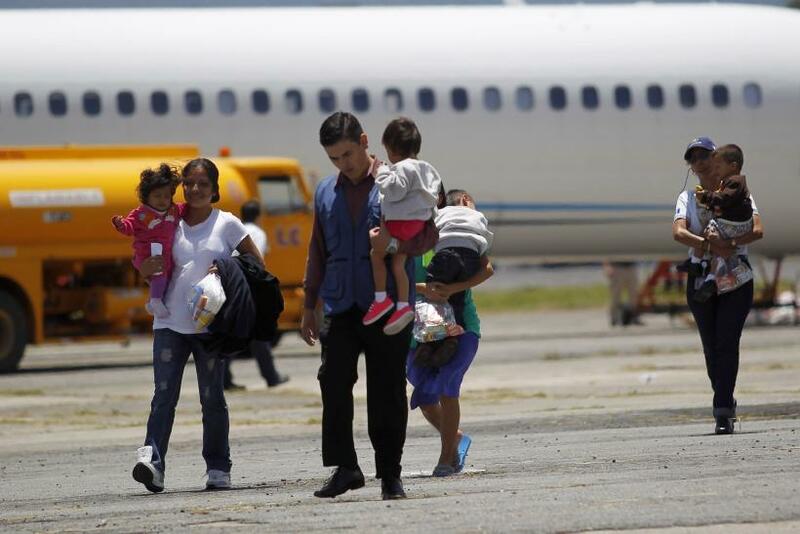 What Happens To Child Migrants After They Are Deported?